Latin for 'bur', referring to the fruit appendages. Nephelium glabrum var. sufferrugineum (Radlk.) Ridl. In undisturbed to slightly disturbed (open sites) mixed dipterocarp, swamp and sub-montane forests up to 1900 m altitude. Usually on alluvial sites and hillsides with clay to sandy soils. In secondary forests usually present as a pre-disturbance remnant, or planted. Food: The trees are cultivated for their very popular fruit. The usually juicy sarcotesta around the seed is eaten. The sweet-tasting fruits are consumed fresh, the more sour ones are eaten stewed. The sarcotesta can be canned or used in jam, but loses much of its flavour. Seeds are edible when roasted, they are bitter and said to be narcotic. Edible tallow similar to cacao butter, with a high level of arachidic acid, can be rendered from the seeds. The colourful fruits are frequently used in displays with flower and fruit arrangements. Timber: The wood of N. lappaceum is liable to splitting during seasoning. It is moderately hard to very hard, strong and tough. The wood is easy to work and can be finished well. It is durable under cover and generally resistant to insect attacks, but susceptible to fungal attacks. The reddish coloured rambutan wood is usually too small to be valued as timber. The average fibre length of wood is 1.07 mm. Tannin or dyestuff: Young shoots are used to produce a green colour on silk that is first dyed yellow with turmeric. The fruit walls are used, together with tannin-rich parts of other plants, to dye silk black after a preliminary red staining. Leaves are used, together with mud, as an impermanent black dye. Lipids: Seeds contain an oil formerly used for illumination and a fat used formerly for soap. Wax: The seed kernel can be used for the production of rambutan tallow, a solid fat similar to cacao butter, which is used for soap and candles. Poison: The fruit wall contains a toxic saponin; cases of poisoning are known. Medicine: Fruit is said to be astringent, stomachic, and anthelmintic; the leaves are used in poultices for headaches. In Java the toxic saponin is dried and used as medicine. In Malaysia, the roots are used in a decoction for treating fever; and the bark as an astringent for tongue diseases. Southern China, Indo-China, Thailand, Peninsular Malaysia, Sumatra, Java, Borneo (throughout the island), Philippines, Celebes. 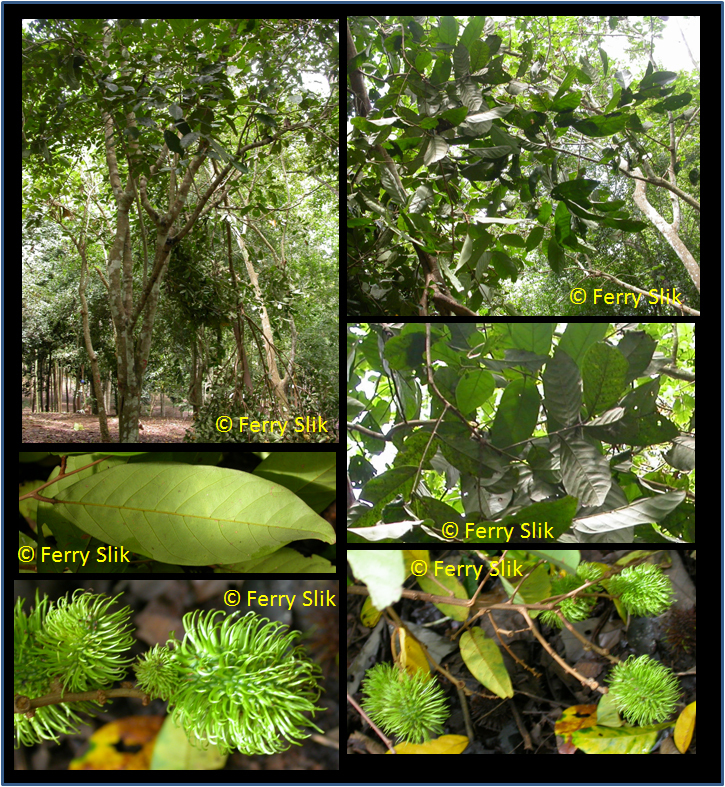 Borneo: Buah beletti, Maritam, Rambutan, Rambutan hutan, Rangalau. Cambodia: saaw maaw, ser mon. Chinese: hooun mo daon shau tsz. Indonesian: chorogol, gente, kakapas, rambutan. Malay: buah abong, rambutan, rangalau. Thailand: ngoh, ngoh paa, phruan ngoh. Vietnamese: ch[oo]m ch[oo]m, chom chom, saaw maaw, vai thi[ee][uf], vai thieu.